Overheard something yesterday that still has me a bit cranked up. Two mature – ah, heck, they were elderly – women were sitting at the next table and talked on and on about their China doll collections. Yep, they had catalogs and everything. Even had a 16- to 20-inch doll with them and talked about going to a “doll show” on Saturday. Then they started talking about world and national events, solving all the problems of the world from their seats there in the coffeehouse. Political unrest overseas? They figured it out. Political unrest in Wisconsin? They figured that out, too. Obnoxiously loud car outside the coffeehouse? They figured out a solution for that, too. Amazing. Yeah, 13.9 million unemployed Americans – and that’s just the number of people who have not given up on seeking employment – are simply going to “reinvent” themselves into rodeo clowns or international spies or whatever. Simple as that. It is not! I should know. I am five days short of being unemployed for two very long years. Those two women do not know what they are talking about. I seriously considered breaking out my coffeehouse ninja skills to throat-punch those two women. But I restrained myself. I figured I would be wasting a perfectly good throat-punch. While I have lived in Stockton the past couple of years, the place I miss – not quite as much as Maine, of course – is Vacaville. It is the closest thing to home that I have known since moving to California. I spent more than 13 years living and working in Vacaville, positioned along Interstate 80 between Sacramento and San Francisco. That location has made Vacaville a fine commuter community. But Vacaville – a farming and ranching community and home to two state prisons long before it was a commuter town – is more than a wide spot along the freeway. It is a family-friendly city with parks and events. A fine selection of retail shops are here, too, mostly because of the freeway access. It is not far from recreational opportunities, including Lake Berryessa and Lagoon Valley Regional Park; it is not that far from the Napa wine region, either. And the city is nestled at the base of California’s Blue Ridge Mountains. Or, at least, I believe they are part of California’s Blue Ridge Mountains. They are beautiful most of the year and when they are not spotted with brush fire. Vacaville is a place I regretted leaving. I did so for career opportunities, which since have soured and dried up. Vacaville is a place where I would live again if I had the opportunity. I ventured to Vacaville today, however, not out of nostalgia, but out of desperation. I have run through my Unemployment Insurance benefits and there will not be more coming unless Congress does something to ease the suffering of the 99ers, the long-term unemployed Americans who have gone through their 99 weeks of Unemployment Insurance. I came to do the unthinkable – cash out an IRA to pay my bills for the next couple of months. I hated doing it; it is just one more sign of personal failure, I suppose. I calculate I will have enough to pay my basic expenses for the next two or three months and still have enough to cover a complete retreat out of California if I still have not found a job in that time. But at this very moment, I am sitting at a table in the Solano County Library’s Vacaville Town Square branch in the heart of downtown Vacaville. Outside the grand floor-to-ceiling windows are Andrews Park and the CreekWalk. A gray squirrel just ran up the embankment along the walk and jumped into a redwood tree. Just a short distance away, two blue jays swept up the creek and into a conifer. People have been walking back and forth since I sat down and up on the hill at Great Wonders Playground, children are playing. Great Wonders was built many years ago with volunteer labor and donations. It was burned down a short time later due to negligence. Volunteers rebuilt the place even better than it was before. That sort of community spirit – building a playground and then rebuilding it just short few weeks later – is what I miss about Maine and what I miss about Vacaville. Coffeehouse observation No. 277 – There’s an etiquette to all this, you know! 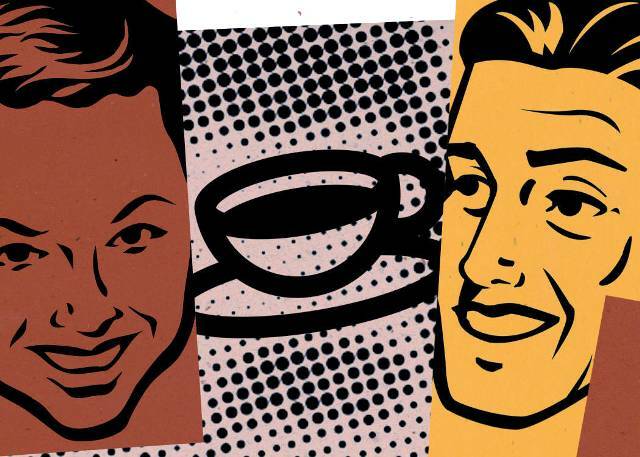 Coffeehouse etiquette is overlooked far too often. Granted, I am no Emily Post – those who have seen me can attest that I am a guy and those who know me rightfully might question my place to offer up etiquette suggestions. But this is not about how to properly place a tea setting. This is about plain, simple manners to consider when venturing out to the neighborhood coffeehouse. Mainly, coffeehouse etiquette follows everyday norms of behavior and several rules that apply to checkout lines also apply in coffeehouse etiquette. Unfortunately, some people simply do not get it. Polite, reasonable adults do not stroll into the “15 items or less” line with a fully loaded grocery cart and pay for the items with a check. Not unless they are looking for someone to throw down with the evil eye. An express line should be just that – an express line. And polite, reasonable adults do not wait until their groceries are checked and bagged to realize that they forgot to pick up Gold Bond Medicated Body Powder and then run off to search the aisles of the store as fellow patrons wait – impatiently – to buy their own items. Their lives are important, too, and “I’ll be right back” only emphasizes that the person is a nit and never should have been let out of “the home” in the first place. Grocery stores – and other establishments that have checkout lines – really should consider installing trap doors to be triggered whenever the words “I’ll be right back” are uttered. People who have forgotten an item and offer up those words should be forced to go to the end of the line. Also, polite, reasonable people do not wait until their groceries are checked and bagged to decide just how they are going to pay for them. People who are still in the Stone Age and pay for items with checks should be encouraged to at least start writing out the check even before they are asked “Is plastic OK for you, today?” They should not wait until the checker asks “Will that be all?” to start writing out the check. A shopper should know the name of the store they are in. A shopper should know the date. A shopper should be able to sign the check while the checker finishes up what he or she is doing. If a shopper is prepared, all they need to do is write in the amount. The people standing in line behind check-writer will appreciate it. There are some pretty similar coffeehouse etiquette rules, all pretty much based on common sense and planning. First and foremost, be polite to your host. The coffeehouse owners and/or baristas are there to take your order, take your money, serve you beverages and treats, and do the best they can to provide a pleasant and even entertaining experience. Do not be rude to them. Polite, reasonable people do not cut line. You never know just how jittery a coffeehouse patron might be or how a person who has been caffeine-deprived might react to such a violation of person space. To expect no reaction is like poking a bear with a sharp stick and expecting it to simply roll over. A person should not wait until they get to the register to begin deciding what they want to drink. They should know what they want and order it. And they should have a backup drink just in case the barista is unable to fill the first request. A coffeehouse patron should not wait until the barista is asking for their money to begin considering whether to ask for a pastry. Caffeinated beverages and pasties go together like Linsey Lohan and the legal system – you cannot think of one without the other. Of course, it is perfectly OK to ask “Is that cherry or strawberry?” if it is unclear. But do not wait until the barista asks “Will there be anything else?” to look at the pastry display for the first time and say “Hmm, what do I want? What do I want? I just don’t know what I want. What do I want?” That will not make friends of anyone standing in line behind you. Polite, reasonable adults should not spill on other coffeehouse patrons. Do I really need to explain this one? … OK, here’s a clarification – spilling coffee, period, is wrong. Don’t do it. Spilling it on another coffeehouse patron is worse. Spilling it onto another coffeehouse patron’s laptop is a hangin’ offense. Polite, reasonable adults should avoid ordering overly obnoxious or complicated drinks just to impress friends. Other patrons in the line will only roll their eyes and be convinced that the person making the order is a coffeehouse snob. Or worse, a coffeehouse neophyte. And I doubt the baristas at the neighborhood coffeehouse will be overly impressed by an order for an extra large, extra hot, extra shot, no-fat, half decaf soy mocha with extra whip cream and chocolate powder, especially when there is a line out the door. If there is a long line, keep it simple; keep the complicated orders for when there is no line. Polite, reasonable people do not wait until the barista has handed over the drink to pull out their wallet from the handbag that was likely designed to be hoisted by Himalayan sherpas. Have the money or alternative payment method in hand. And if the coffeehouse hands out drink cards – buy 10 and get the 11th free – have that out with the money. A polite, reasonable person most likely will forgo the stamp if the line is long and they cannot immediately produce the card. Or – and this most likely is faster than fishing through a large duffle-bag purse for a wallet – ask for a new card. Polite, reasonable people do not take up more space than do small nations. I have seen people place their books, laptops and other belongings on one table and move to a completely different table to read a book or newspaper. I have seen a boyfriend and girlfriend sit at different tables and then sit on a coffeehouse sofa smooching, tying up two tables and a sofa on a busy day for the coffeehouse. That leaves patrons standing and it is not polite or fair. Do not ask to use a complete stranger’s laptop. Just don’t do it. Do not let children run around screaming at the coffeehouse. Just don’t let it happen. Do not loudly dictate a letter over a cell phone. For that matter, do not speak loudly – on your cellphone or to a “bestest buddy” – in the coffeehouse. Other people are trying to accomplish other things at the coffeehouse – even if it is quiet time between appointments – and they should be given the courtesy that we should all expect. Do not forget headphones or ear buds. If I am using the WiFi graciously offered by the coffeehouse to its paying patrons, I do not want to hear screaming, yelling, music or talking coming from someone’s laptop that is loud enough to drown out the music in the coffeehouse. That’s just plain rude. Polite, reasonable people will bus their own tables. It is simply rude to consume a bagel at one table and move to another, leaving behind the plate, crumbs and wadded up napkins. OK, I have had my etiquette rant for 2011. Now go out and enjoy your coffeehouse. Karen Douglass of Orland rests with bandaged legs after being rammed by a young bull moose on Feb. 10. Grimley (white) and Wilbur (black and white) were two of her three dogs who found the moose and instigated the event. Douglass suffered an injured shoulder from the moose impact, another injured shoulder from hitting the ground, mild hypothermia and frostbite on her lower legs. 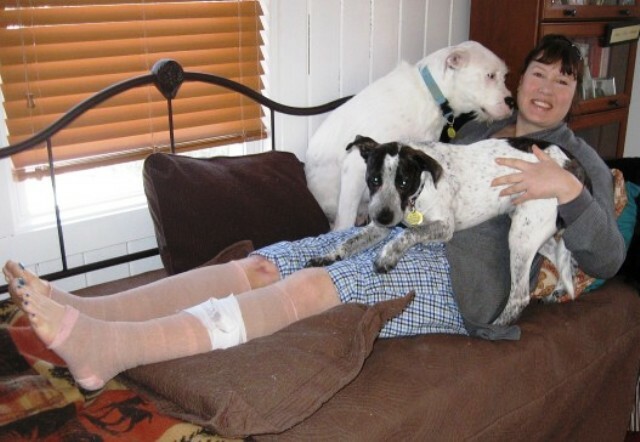 She also suffered severe leg bruising, mostly from the difficult trip home without her snowshoes. Oh, lovely! Someone in the coffeehouse smells like old, wet cat. Overheard in the coffeehouse spoken by a twentysomething college student: “Yeah, someone right out of high school doesn’t get it because they haven’t lived yet.” Huh? Great Whoopie Pie Compromise in Augusta | The Portland Press Herald / Maine Sunday Telegram. Maine town to celebrate snowshoes | The Portland Press Herald / Maine Sunday Telegram. Yesterday, I spotted a guy walking down my street playing a banjo. Today, a guy with a faux buffalo head hat – complete with antlers – just walked by the coffeehouse. There really is something in the Stockton water. It might be booze.